Like so many of the animals at the farm, Goldi was thrown over the fence one night by some person who no longer wanted her. We learned very quickly that rabbits do not tolerate newcomers. The resident rabbits let Goldi know, quickly and viciously, that she was not welcome. We found her a temporary foster home until we could figure out how to find her permanent lodgings. We hoped we could adopt her out, but then she gave birth to a litter of baby bunnies. We might be able to find one bunny a home, but finding homes for five bunnies seemed like the impossible dream. None of the rabbit rescues we called had any space. 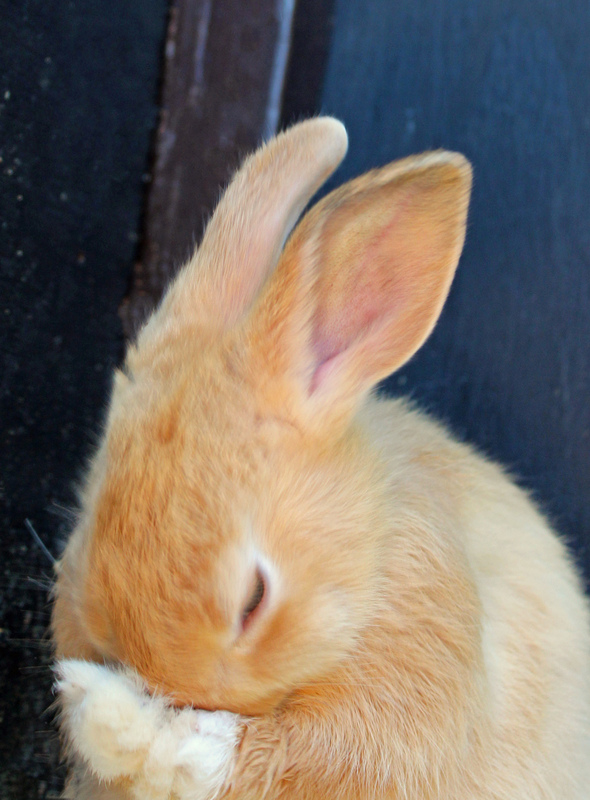 Apparently, lots of people dump rabbits and very few adopt them. So now we had to find space at the farm for Goldi and her babies. Thank heavens for the kids at the school. They worked many weekends to build a first class bunny barn with a separate area for the resident rabbits and one for Goldi and her daughters. Now all the bunnies can tunnel and play and enjoy life without the fear of territory disputes. Harley got her name because of her harlequin coloring. Sadly, her mama was abandoned at the farm and did not get along with the resident rabbits. Happily, one of the at-risk kids from the school took her on as a foster bunny and gave her a place to stay and have her babies. Harley has been loved by people since she was born and it shows. Harley is up for adoption. She is certainly welcome here at the farm, but she would rather be someone’s beloved house bunny. Wouldn’t you? Milly is one of Goldi’s daughters. She is a happy girl and you would never know that her heart is weak. Heart problems are very rare in rabbits and we almost couldn’t get her spayed because the doctor was not sure he would know what to do if her heart rate went too low during surgery. We took Miss Milly to a specialist for an EKG and an overall exam. Fortunately, the specialist said that although Milly’s heart rate is slow, she is quite healthy in every other respect. With the approval of the rabbit specialist, the clinic spayed our little girl and now she will get to live with her family in peace for the rest of her life. Carob is a tiny girl dressed in tones of brown and black. She was thrown out at a public park in the hills where coyotes are known to hunt. Carob is a pet rabbit. She has no clue how to keep safe, how to find good food, or how to take care of herself. She depends on people to care for her. A sweet, shy girl who would have met her death in the jaws of a hungry predator in a matter of days if a kind soul had not come and saved her. At Kindred Spirits Care Farm, she gets to live in a large pen that was specially designed to make rabbits happy. She can safely dig tunnels to her heart’s content without the worry of finding herself on the scary side of the fence. She lives with her three rabbit friends and she eats the best food, hay and almost every day delights in fresh veggie treats. Maple is a young bunny who found himself in very dangerous circumstances. He was trying to survive in the hills above Los Angeles, but he had no idea what to do. He got some nasty wounds on his neck and face and needed surgery when he was rescued. 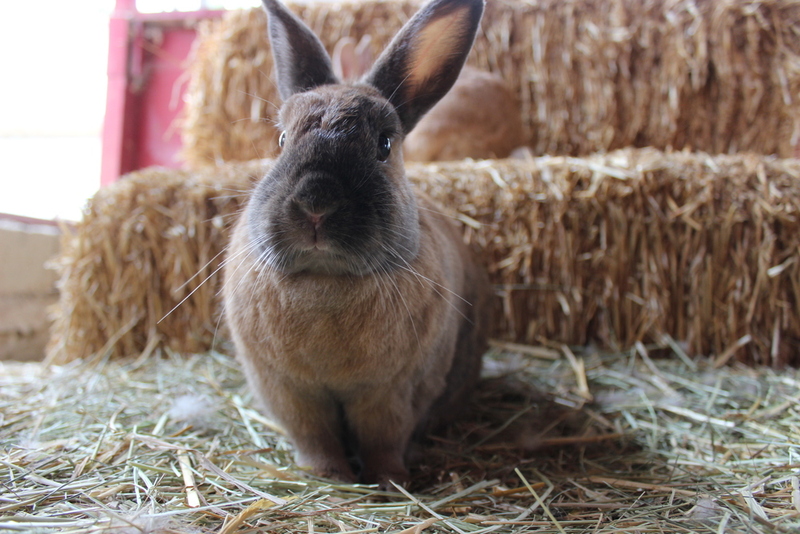 But now he is a happy boy living at Kindred Spirits Care Farm with his friends in a large bunny pen built just for them.